Bone broth and gelatin have long been used to heal digestive problems, but scientists have recently uncovered the science behind the nutritional power of these foods – the key is collagen! The unique structural properties and amino acid profile of collagen allows this protein to help in reducing gut inflammation, heal stomach ulcers, aid in digestion, and regulate stomach acid secretion. Scientific research has shown collagen synthesis to be an essential biological process in repairing the intestinal lining. 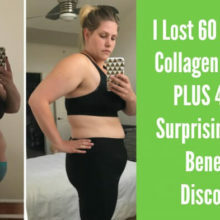 Collagen and gut health are related; read below the benefits of supplementing with collagen for leaky gut and other gut conditions. Collagen has been found to regulate the secretion of gastric juices by ensuring enough acid for proper digestion. Collagen protein also prevents an excess of gastric juices, which can lead to heartburn, stomach ulcers, and other painful digestive problems caused from an overly acidic environment1. Glycine and Proline, the two main amino acids in Further Food Collagen Peptides, may help heal the stomach lining and prevent stress-induced ulcers through their positive impact on the central nervous system. Studies have identified glycine as an effective inhibitor of stomach ulcers due to its ability to prevent harmful gastric secretions in the stomach lining2. Another collagen and gut health benefit is that collagen helps digestion. Because collagen is a hydrophilic molecule, it has an attraction to water and acidic molecules, which aids the digestive process. Ingested collagen surrounds itself with water and stomach acid as it moves through the GI tract, which assists the breakdown of other proteins and carbohydrates in the intestines. Additionally, by holding water in the intestine, collagen helps move food through the GI tract more smoothly. Have you considered supplementing with collagen for leaky gut? Glutamine, one of the amino acids in collagen, has been identified as the key amino acid for preventing inflammation of the gut wall and healing leaky gut syndrome. It has been linked to inhibiting inflammation and oxidative stress associated with the opening of tight junctions in the connective tissue of the intestinal lining4. Studies have found decreased collagen levels in individuals with digestive imbalances. Specifically, there is an association between inflammatory bowel disease and decreased serum collagen levels5. Supplementation with collagen protein is key to providing relief for digestive diseases. 1. The Important Role of Collagen in Digestive Health.” LQ Liquid Health, 29 Jan. 2018, www.lqliquidhealth.com/the-important-role-of-collagen-in-digestive-health/. 2. Tariq, M. Studies on the Antisecretory, Gastric Anti-ulcer and Cytoprotective Properties of Glycine.National Center for Biotechnology Information. U.S. National Library of Medicine, <http://www.ncbi.nlm.nih.gov/pubmed/9344231>. 3. Graham, MF. Collagen Synthesis by Human Intestinal Smooth Muscle Cells in Culture. National Center for Biotechnology Information. U.S. National Library of Medicine. <http://www.ncbi.nlm.nih.gov/pubmed/3792777>. 4. Lin, M. L-Glutamate Supplementation Improves Small Intestinal Architecture and Enhances the Expressions of Jejunal Mucosa Amino Acid Receptors and Transporters in Weaning Piglets.National Center for Biotechnology Information. U.S. National Library of Medicine<http://www.ncbi.nlm.nih.gov/pubmed/25368996>. 5. Koutroubakis, IE. Serum Laminin and Collagen IV in Inflammatory Bowel Disease. National Center for Biotechnology Information. U.S. National Library of Medicine <http://www.ncbi.nlm.nih.gov/pubmed/14600124>. what is the difference between Collagen and Gelatine and which is the best for gut and skin benefits . Both Collagen peptides and Gelatin have the same gut and skin benefits since they come from the same source-collagen. The difference is in the use-collagen peptides can be mixed into any food or beverage without added texture, while gelatin “gels” in liquids so it is often used as a thickener to make jello, gummies, and puddings. Hi , I’m a young 63 , but I have digestive issues, I have A hiatal hernia, I take Omeprazole for severe acid reflux. I’d like to know if this will help me , my stomach is also bloated and I carry extra weigh only in my stomach, will this help? Thanks for the question. Collagen supplementation can help with gut issues, including digestive issues and ulcers. You can read more on the relationship between collagen and gut health here: https://www.furtherfood.com/collagen-protein-superfood-gut-health-heals-leaky-gut-digestive-problems/ We also recommend that you consult with your medical care provider for specific guidance in relation to your condition. Hi. I am male 72 yo. I would like to take collagen for both gut & joint health? Which collagen is best for me? Which form of collegan helps gut? Type 1 , type 2, type 3 or types 1 and 3 combined in a powder? I got recently some powder and it says its made with 1 &3. Our Further Food Collagen powder is made of Type 1 and 3 which provide the best gut health benefits. I can confirm that collagen has done wonders for my stomach. I mix it with glutamine powder and squeeze some lime juice in there (Vitamin C is necessary for collagen digestion). Will you be able to develop a vegan collagen protein powder? I would definitely purchase it. Hi Barbara: We are now working on a marine collagen product and hope to come out with a vegan product later in the year. Stay tuned!